Enjoy our complimentary a.m. Kitchen Skillet, with hot breakfast items, fresh fruit, oatmeal and plenty more to choose from. Served daily from 6:30am-9:30am (Monday-Friday) and 7:00am-10:00am (Sat-Sun) in our Guest Kitchen. Guestrooms include mini refrigerator, coffee maker, hairdryer, iron and ironing board, and offer a city or river view. The bedroom and living area are separated by a half wall to offer semi-privacy. The 42in HDTV is in the center of the room for viewing capability from the cozy corner or Hyatt Grand Bed area. Just a short walk to the enjoyment of fine dining, shopping, and entertainment. We are on the corner of Xesar Chavez & St. Mary's Street. Riverwalk access is right out our backdoor, and within 5 minutes you are in the entertainment and dining area plus the Riverboat rides. Walking distance to the King William Historic District, Convention Center, Children's Museum, La Villita, Arneson River Theater, RiverCenter Mall, the Alamo and much more! Other nearby attractions include Witte Museum, San Antonio Zoo and Alamodome. We are only a 15 minute drive to SeaWorld of Texas or Six Flags Fiesta Texas! Wi-Fi available. Nearby companies include HEB, Federal Building & US Courts Training Center, SBC, CPS, Nortel, Bank of America, Booz-Allen, Valero - 4 miles, Wells Fargo-4 miles, Fort Sam Houston-4 miles, Boeing - 7 miles, Lockheed Martin- 7 miles, Kelly USA-7 miles, Lackland AFB -7 miles, Brooks City Base 5-miles, & Toyota Motor Manufacturing-Texas, Inc - 10 miles, Randolph AFB-14 miles. Nearby golf courses: Quarry - 5 miles, Pecan Valley - 5 miles, Silverhorn-12 miles. Pet Policy - 1-6 nights a 75 Non-Refundable fee. 7-30 nights a 75 Non-Refundable fee plus an additional 100 cleaning fee. Maximum of 2 dogs per room are permitted. Weight must be 50 lbs or less max of 75 lbs per room. Fees are in USD. Service Animals are exempt from fees. Located on the San Antonio River in the heart of downtown, Intersection of Cesar Chavez & S.St.Mary's St. 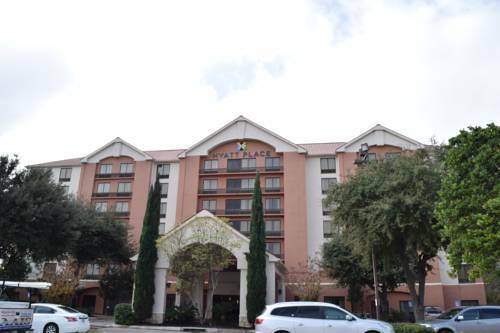 Walking distance to the La Villita/Arneson River Theatre area.Near Hemisphere Park Tower, Institute of Texan Cultures,Alamodome, and the King William Historic District. Cancel by 4pm Hotel Time 48 Hours Prior to Arrival.